KAFR KILA, Lebanon (AP) — The giant posters of Hezbollah fighters killed in Lebanon's wars with Israel still dot the picturesque landscape of southern Lebanon, the few remaining reminders of some of the epic battles that once made the Shiite guerrilla group and its leader Hassan Nasrallah heroes in the Arab world. Nowadays, they are overshadowed by fresh portraits of Hezbollah fighters who have died fighting fellow Muslims in the civil war in neighboring Syria. It's a striking transformation and a strategic shift for the fiercely anti-Israel group, one that some of its most loyal supporters in the Shiite community may be reluctant to embrace. Hezbollah's very public and bloody foray fighting alongside President Bashar Assad's regime against rebels in Syria's 2-year-old civil war has a steep price. It has emboldened the group's critics in the Arab world and its Western-backed political opponents in Lebanon. It also risks wrecking the group's already eroding image among many Lebanese as their champion and protector against Israel, which it drove out of southern Lebanon in 2000 and fought to a standstill in 2006. Also, by linking its fate to the Assad regime's survival and declaring war on Syria's mainly Sunni rebels, Hezbollah also could bring the war directly into Lebanon. Its stance threatens to spark retaliation from Lebanese Sunnis supporting their Syrian brethren or from the rebels themselves carrying out attacks against the Shiite group on its home turf in Lebanon. Recent rocket fire against a pro-Hezbollah neighborhood of Beirut underlined the threat of violence spreading. 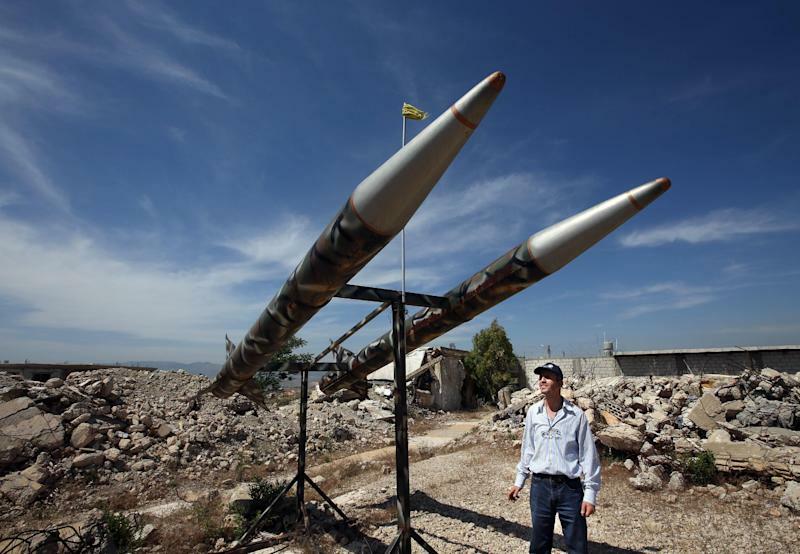 Hezbollah, which was founded in 1982 with Iranian support to fight Israel's invasion of Lebanon, has not carried out a single known rocket attack into Israel since the 2006 war. Many among the group's Shiite constituency — about a third of the population — are tired of wars and even the most ideologically committed to Hezbollah's anti-Israel rhetoric are reluctant to see their villages destroyed again. Now, as more of their men return home in coffins from Syria, the group faces an uphill battle in trying to convince their countrymen that the war in Syria is part of their wider battle against Israel and its U.S. backers. "If Israel comes back to Lebanon, I will be the first volunteer to go on the battlefield," said Ahmad Taleb, a 37-year-old Shiite from the Aaita border village, where Hezbollah's killing of Israeli soldiers triggered the 2006 war. Taleb spent 11 years in an Israeli jail during the country's 18-year occupation of south Lebanon, which ended in 2000. As for heeding the call to fight in Syria, Taleb was reluctant. "I will not volunteer, but I will go if the party tells me to," he said. In a weekend speech marking the anniversary of Israel's withdrawal from Lebanon, Nasrallah sought to portray the fight in Syria alongside Assad's army as an existential war aimed at protecting Lebanon. He said Hezbollah's mission is to defeat an Israel-led axis of the group's enemies, including the United States and its Gulf Arab allies, who have backed the Sunni opposition in Syria. He sought to convince Shiites that their existence is threatened by Sunni radicals among the rebels operating near Lebanon's border in Syria. "If Syria falls into the hands of the Americans, Israelis and takfiris, the resistance will be isolated and then Israel will enter," Nasrallah said, using a term for Sunni militants. "Syria is the backbone of the resistance and we cannot stand with our arms crossed when the backbone is being broken." For months, Hezbollah denied its fighters were assisting Assad in the military crackdown against rebels. A steady trickle of dead Hezbollah fighters were buried hastily in covert funerals. But when dozens of its fighters were killed in the Syrian military's offensive in Qusair, a strategic town near the border with Lebanon, the extent of Hezbollah's involvement became difficult to hide. The group was forced to announce officially that it had joined the fight. Like their fallen comrades in the wars with Israel, the group's fighters who died in Syria are now paraded publically as "martyrs," their posters featuring heavily in Shiite towns near the border with Syria and in villages of south Lebanon. But there is a discernible difference. While those who died fighting Israel are hailed as national heroes, the Syria "martyrs" are featured on posters as the "guardians of Sayida Zeinab shrine," in reference to a revered Shiite figure whose shrine is located outside the Syrian capital, Damascus. The poster underlines what critics say is Hezbollah's shift from being Lebanon's defense against Israel to a much narrower image as defender of the Shiite sect in the region. "The support of the Lebanese and the Arabs that Hezbollah had in the war with Israel was its major strength," said Fawaz A. Gerges, the director of the Middle East Center at the London School of Economics. "It's quite the opposite in Syria as Nasrallah struggles to convince the Lebanese Shiite community that provides the group with legitimacy of the necessity to intervene in Syria." "The longer Hezbollah's presence on Syria's killing fields will be, the more vulnerable Hezbollah will become in any future confrontation with Israel," he added. 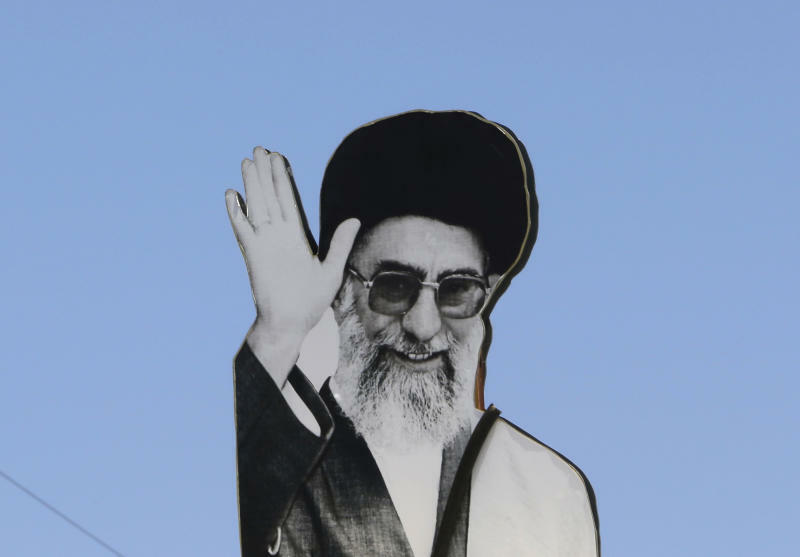 Once lauded in the Arab world as a heroic resistance movement that stood up to Israel, Hezbollah has seen its popularity plummet in the region because of its staunch support for Assad. The blatant intervention in Syria even drew rare criticism from the Lebanese president this week. "The resistance is more noble than to get bogged down in the sands of dissension, whether in Lebanon or in neighboring countries," Michel Suleiman said in a statement. Hezbollah appears to be banking on continued support from Lebanon's Shiites, for whom it provides an extensive social support system. For now, Nasrallah can still bask in the cult-like adoration that his Party of God enjoys among many Shiites. Sunni-Shiite tensions run high, and many Shiites are convinced there is a Sunni threat. But there is a noticeable sense of longing for earlier days when the enemy was much more clear-cut. In the southern town of Kafr Kila, residents recall Hezbollah being synonymous with national pride. Following the 2000 Israeli withdrawal, the towns near the Fatima Gate border fence separating Lebanon and Israel became a meeting place for the group's supporters from Lebanon and beyond to stage demonstrations and throw stones into Israel. 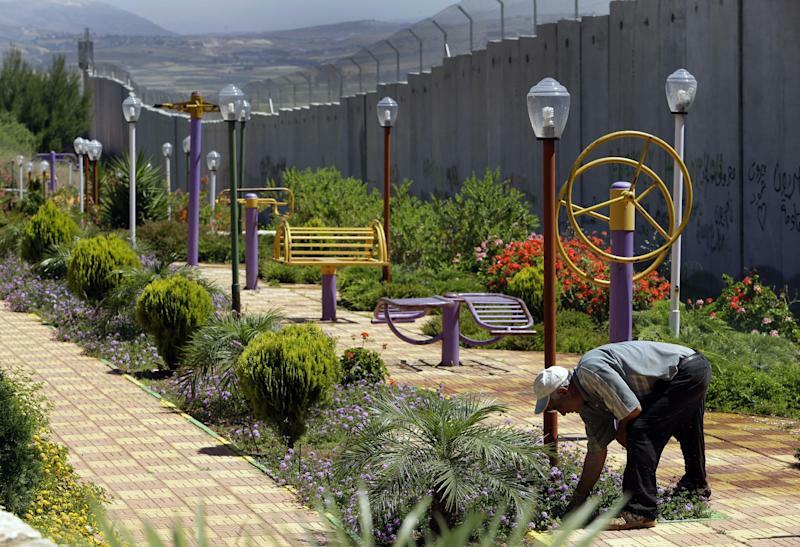 Then a year ago, Israel built a wall along the town's stretch of the border, blocking the view of its territory and ruining the main show in town. That wrecked the family business of the Chetet brothers — the Fatima Gate Restaurant and a Gift Shop, a popular stop for the fence protesters. "It was good business, but now, nobody comes anymore," said Mohammed Chetet. "Who wants to sit and stare at the wall?" He blew dust off Hezbollah souvenirs, remembering old times when the mugs with the Nasrallah's portrait, T-shirts, key chains and pens with Hezbollah's insignia would fly off the shelves. Smoking a cigar, Khalil Abdullah inspects preparations for a weekend flood of Lebanese tourists to his Wazzani Fortress resort. It's an ambitious $3 million project that he opened last year, with luxury chalets, a pool and a restaurant along the Wazzani River, which forms the frontier in southeastern corner of Lebanon. On the other side, Israeli soldiers in the Golan Heights often gawk at the guests having lunch and dipping their feet in the river. The 58-year-old businessman said he does not fear losing his investment in a future war with Israel. Hezbollah is there to protect them. "It will be a short war, if it comes, because Israel will quickly realize it was a mistake to challenge the resistance."